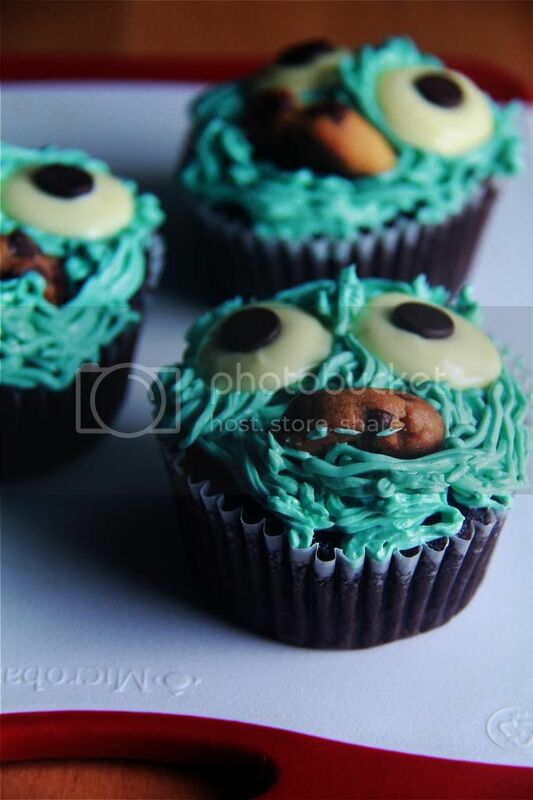 Crumbs and Cookies: cookie monster cupcakes. In recent months I've started developing an appreciation for the spontaneous creativity of baking, choosing to create something out of little recipes here and there rather than following prescribed ones from cookbooks. I could attribute part of this to the lack of time for leisurely cookbook browsing lately, but really, I think it is because of the thrill of seeing something that you've envisioned come to life, successfully or not. 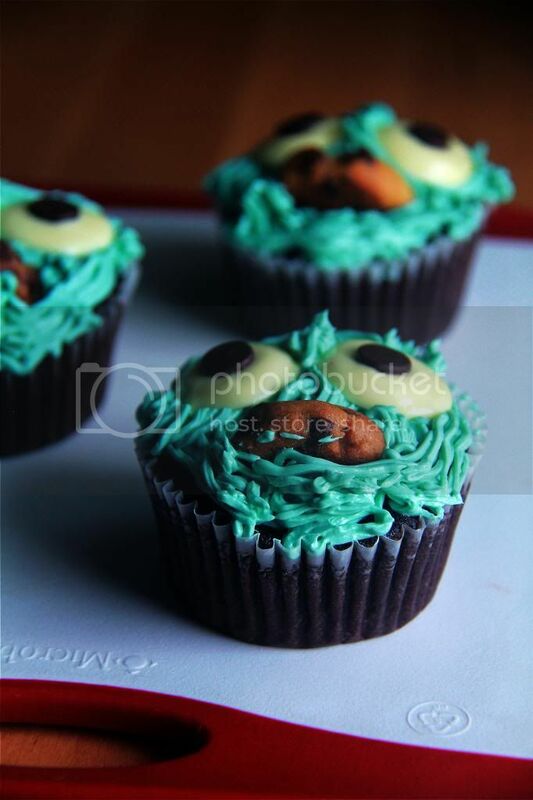 Of course, I can't lay claim to this cupcake idea - cookie monster cupcakes have been around for the longest time already - but I enjoyed creating them all the same. There were many hiccups as usual - the frosting not being blue enough, the cookies not flat enough, the eyes being too big. I don't think they could even be relatives of cookie monster truth be told but hey, we live and learn. The next time I make an elmo cupcake or something, at least I have a rough idea of possible pitfalls and make sure that I look out for them. 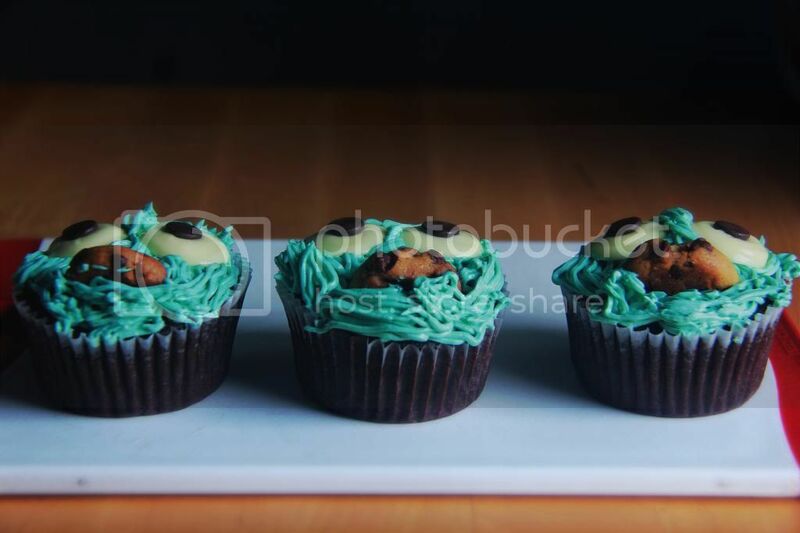 For these cupcakes, I used one of my favorite chocolate cake recipes and just a regular vanilla buttercream tinted with blue. The eyes are pretty simple to make, just melt white chocolate, dollop small circles of them on a sheet of parchment and top with a chocolate chip (tip facing down). Chill until firm. And you can just use your favorite chocolate chip cookie recipe. I used the leftover dough from making this granola. And just my personal opinion: the "fur" of cookie monster is much harder to execute than I thought it would be. You would think that squiggling buttercream over the entire surface of the cupcake would be a piece of cake, but to squiggle it in a deliberately messy yet artful way is something I have to seriously work on. 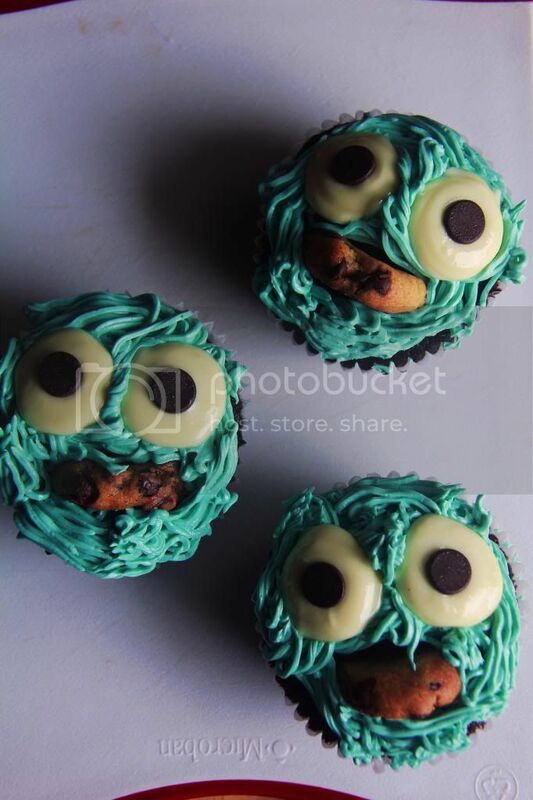 And I thought that I my piping skills could get no worse. P.S. There's a video on my instagram featuring a (nearly) step-by-step process of the decorating of the cupcakes. Go check it out!